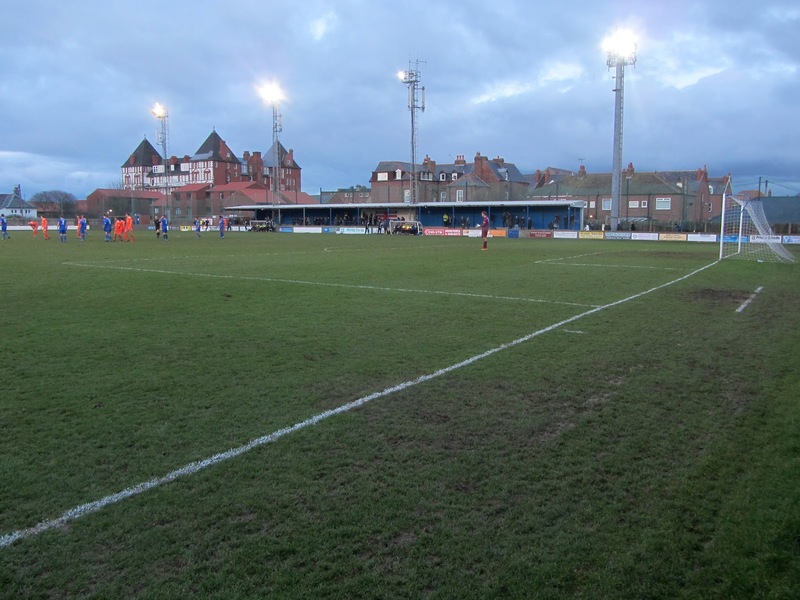 My thirty-sixth ground of 2017 was on Tuesday 26th December at the Turnbull Ground in Whitby, North Yorkshire. 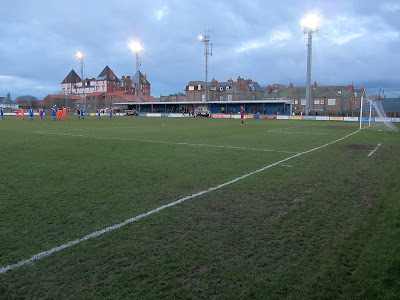 The match was Whitby Town vs. Farsley Celtic in the Northern Premier League Premier Division. 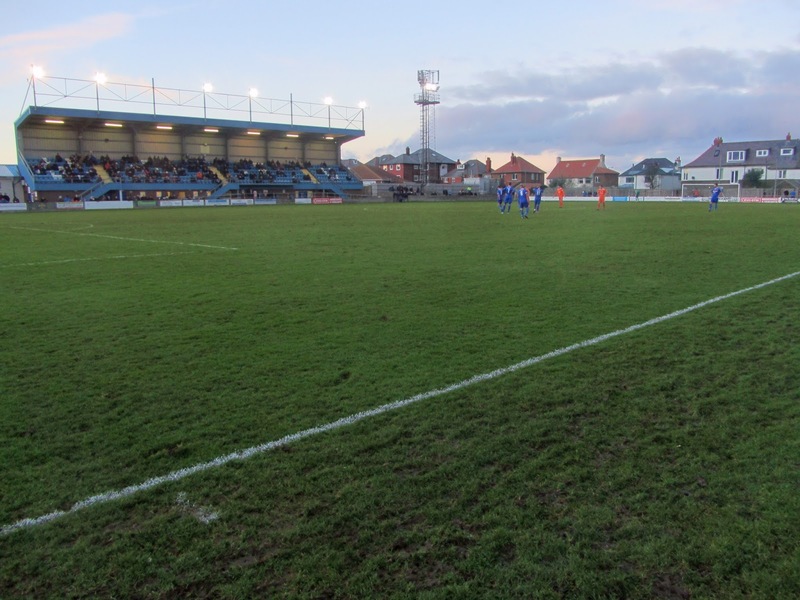 The Turnbull Ground is located in the north of the town just a street away from the promenade and the slope down towards the North Sea. It is in a predominantly residential area with housing surrounding the grounds on the northern, eastern and southern ends. On the western side the club are neighbours to Whitby Cricket Club. 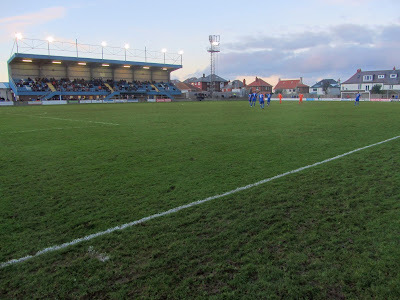 The venue is three-quarters of a mile north-west of the poorly served Whitby railway station and has been home to the club since 1929. The ground is dominated by a 505-seat stand on the western side of the ground. This is a little over a decade old with the seating section elevated above the pitch and the interior of the stand underneath this. The positioning of the stand allows a narrow flat concrete standing area to be retained in front of it. 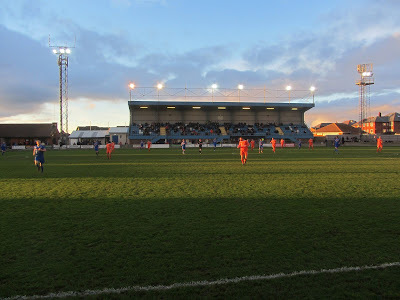 The stand straddles the half-way line and to the south of it is a snack bar, the entrance turnstiles and a club building with the players dressing rooms. Adjacent to the north of the stand is an uncovered concrete terrace. Behind the ground outside the main entrance is a small car park and a clubhouse containing a bar. There is a covered six row concrete terrace for around half the length of the eastern side of the Turnbull Ground. The two dugouts sit in front of the stand with the rest of the eastern section taken up by uncovered concrete standing. The northern and southern areas are fairly narrow due to the housing bordering both ends of the complex so there is only room for uncovered hard standing behind the goals. Due to the proximity of the residential areas there is netting the whole way along these ends to prevent balls hitting houses. Whitby started the 90 minutes on a dreadful run of 15 games without a win and within the first 60 seconds they almost fell a goal behind when poor defending saw Nathan Cartman ghost in behind the backline. Cartman just had the keeper to beat but dragged his shot wide from 12 yards. The hosts had their best opportunity of the half in the 18th minute when Lewis Maloney's free-kick fell at the feet of Junior Mondal and his quick shot was straight at Farlsey keeper Graeme McKibbin with the ball bouncing off him before being headed away. In the 26th minute Dan Cockerline crossed the ball from the right wing into the area for Nathan Turner who took a shot which was saved and bundled in by Nathan Cartman on the rebound. Farsley weren't celebrating for long though as a check over to the touch line showed the linesman's flag was up for offside. A poor first half petered out after that with little of note happening until the first goal of the game arrived in the 57th minute. Unsurprisingly it was the visitors who got as the ball was out played out wide left to Paul Walker who cut inside before curling a great shot in off the far post. The lead was then doubled in the 62nd minute - Isaac Baldwin played a neat 1-2 with Paul Walker down the left before crossing from the byline for Dan Cockerline to tap in on the line. The home side was given some hope in the 84th minute when Farlsey were reduced to ten men when Lewis Turner deliberately pulled down Junior Mondale as he raced towards the area. Whitby had more input into the game after this and in the 94th minute were awarded a spot kick when Isaac Baldwin clumsily felled Kieran Weledji as he attempted to intercept the ball on the far side of area. Luke Bythway took the kick but his poor penalty to Graeme McKibbin's right was saved summing up a forgettable day for Whitby.